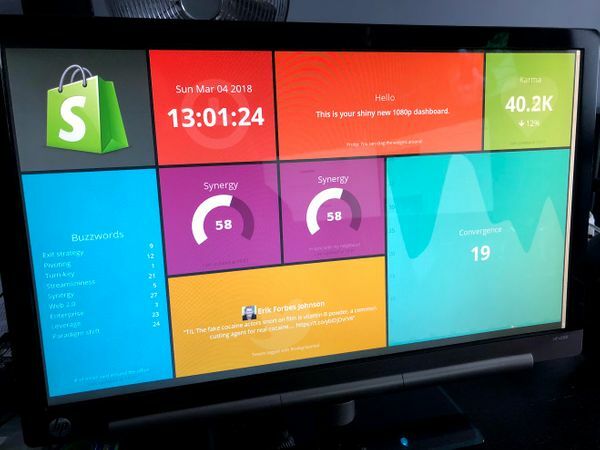 At The Floow we use Raspberry Pis as Chromium Kiosk Clients to monitor our systems and infrastructure, we are now looking to Network Boot them for this and a few other uses (hopefully coming soon) so that they are easy to manage collectively without needing to flash numerous SD cards, and additionally removing need to worry abou the life of SD cards after many write operations. It is also possible to Network Boot a Raspberry Pi 2. 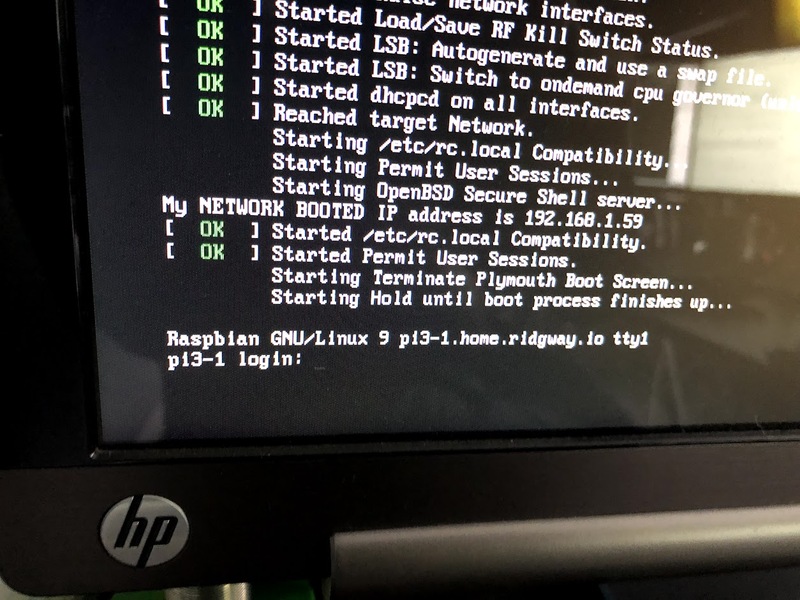 In this set of steps we will copy a new Raspbian install, with a few tweaks to our boot server and expose it over an NFS share. Download the Raspbian Lite Image from here. 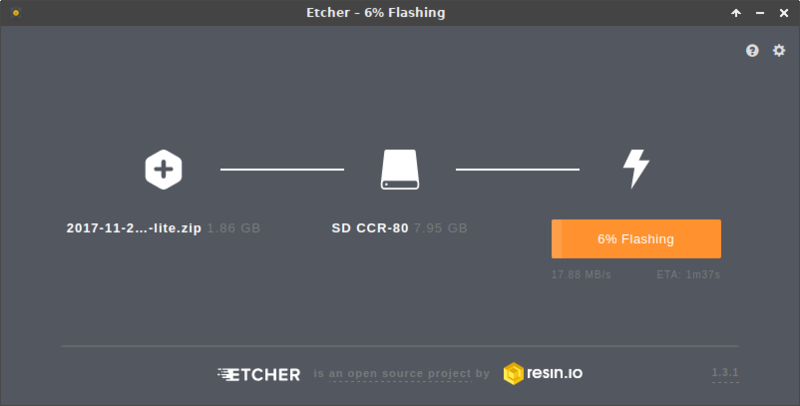 Flash to a Micro SD card, the easiest way is to use Etcher (it will even take a zip directly and also verifies the content after). Note: This will need a screen, keyboard, and Ethernet cable (with internet access) connected. 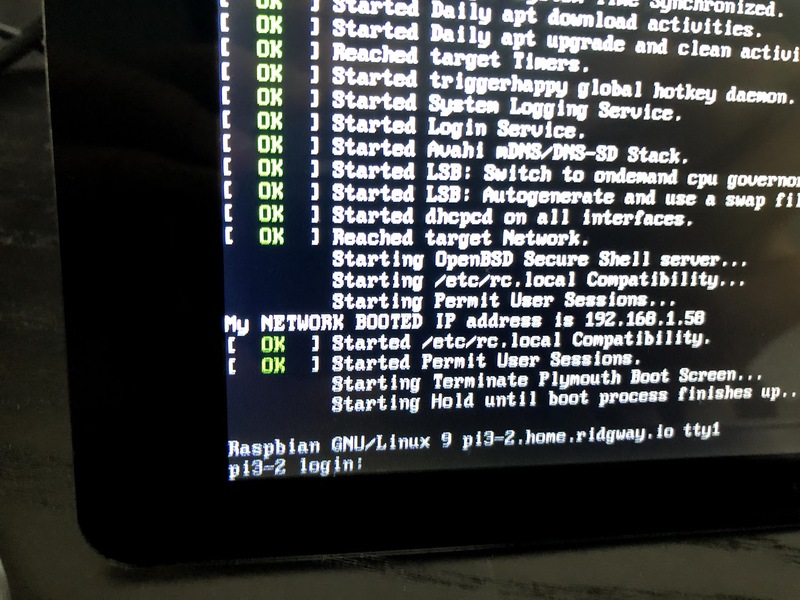 Once the Pi boots login with the default credentials (pi / raspberry). 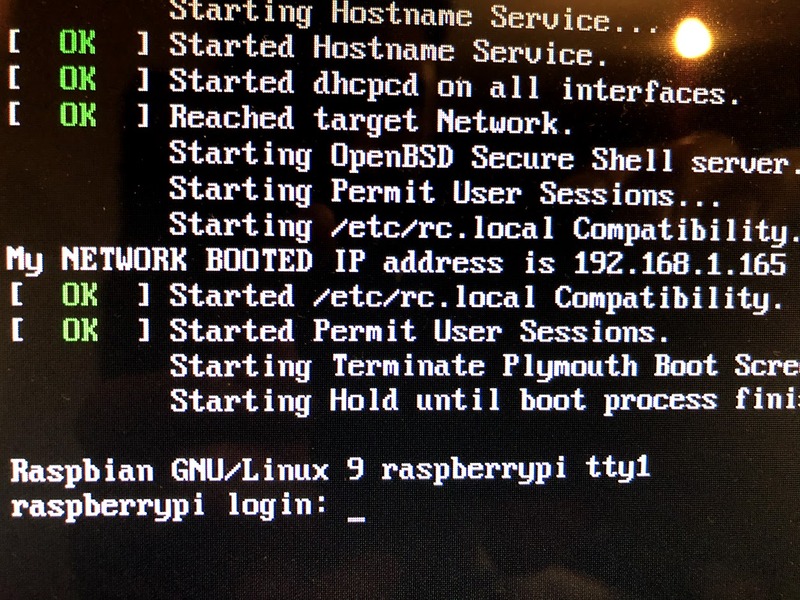 Run sudo raspi-config, selection Option 5 (Interfacing Options), P2 (SSH) and select Yes to Enable SSH. You can then quit this utility and continue the following steps via SSH if preferred, or continue locally. In this case our wired interface is eth0, which has the address 192.168.1.135. First, run sudo apt-get update to ensure all package index files are up-to-date. Then, run sudo apt-get upgrade to install the newest versions of all packages currently installed. 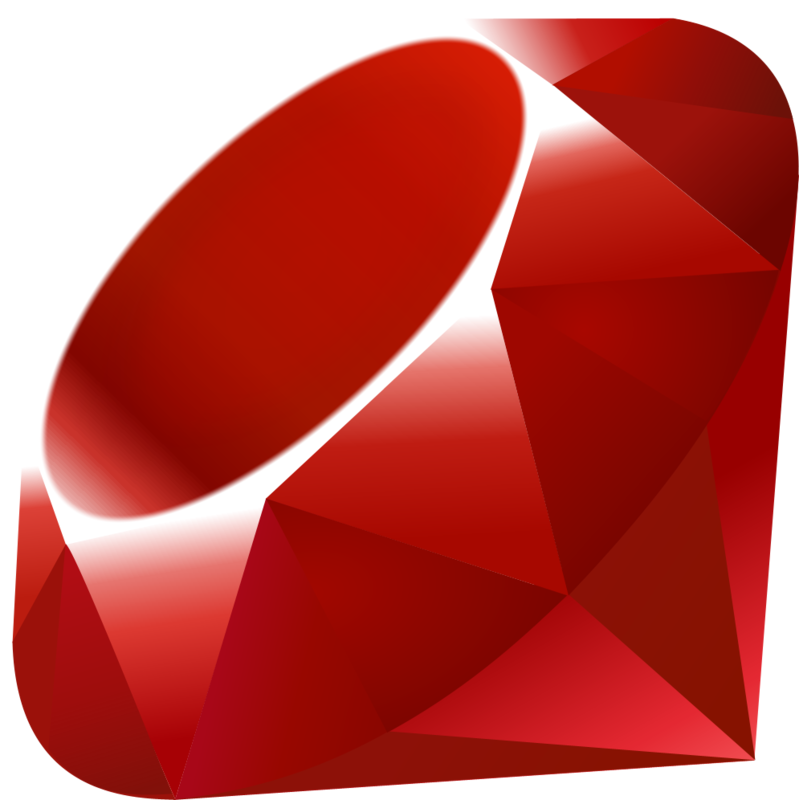 Then, run sudo apt-get dist-upgrade which intelligently handles changing dependencies with new versions of packages. In both cases when requested, check and confirm you are happy with the changes proposed. Certain files from the next branch of the rpi-firmware repository are required for this process to work. This step is probably optional if bootcode.bin is used from GitHub in the TFTP steps below. 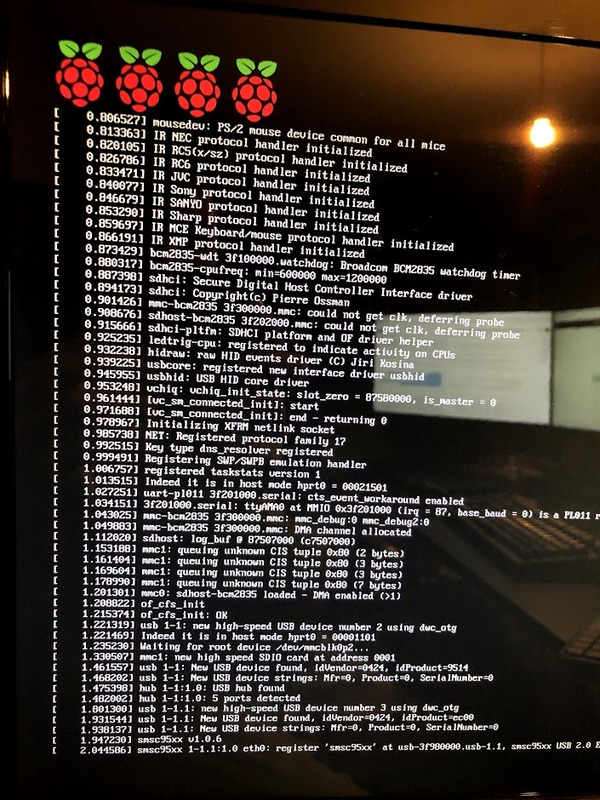 Edit: I've also observed using the 'stock' raspbian kernel img files can cause nasty boot errors. Edit (2018-07-14): Warning, the next branch appears to be out of date now, updating from master (the default) works fine for 3B+. 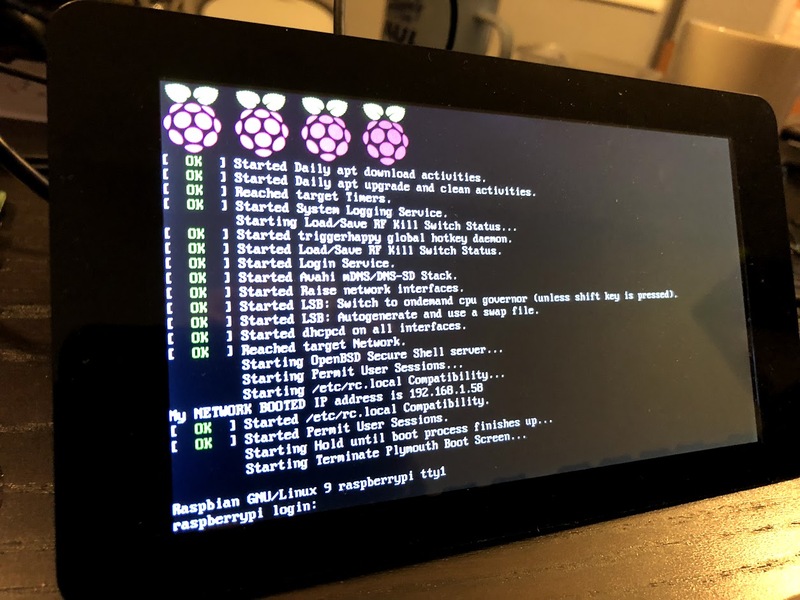 Details on rpi-update can be found here https://github.com/Hexxeh/rpi-update. So, reboot now with sudo reboot. Note: You must do this on a running Pi, copying off the SDK card on another host did not appear to work. Then create a tar archive of the nfs folder (you could gzip it but as the Pi isn't all that powerful its probably not worth it vs transfer time, but this is just an assumption). The -p flag should preserve permissions etc. We are now done with this Pi for now, the SD card will be used later. There are alternate instructions below for 'cloning' an existing Pi using rsync to preserve permissions which can be quicker if you want to clone direct to your server. These steps enable USB Boot Mode (which includes PXE) on the Pi. Either by repeating Step 1 above, or just re-using the card as left by the previous section, boot the Pi again. We must enable USB Boot Mode (which also supports PXE). If the output ends with 3020000a then it has worked. Once more we are done with the Pi and SD Card for now, you can revert the /boot/config.txt change if you wish to keep using the card for other things, the rest of the /boot partition on the SD card will still be needed later. In this set of steps we make the required server-side changes to allow it to boot. Your local DHCP server needs to be able to send a couple of specific DHCP options. My server is already running the ISC DHCP Server which can be installed with sudo apt-get install isc-dhcp-server. The address of the next-server directive has to be added: next-server 192.168.1.50;, as well as the tftp-server-name: option tftp-server-name "192.168.1.50";. I have not come across the need for the tftp-server-name entry before when PXE booting standard (x86/x64) computers/servers. This thread helped narrow down some of the required config changes for isc-dhcp-server. When the Pi is powered on after USB Boot Mode is enabled you can see it looking for an IP. Note: The log does not indicate failure due to this file not yet existing. Copy all the files from the /boot partition of the SD card to the /tftpboot folder. If the Pi Firmware was updated as detailed above then it should be fine, however if not the latest bootcode.bin from GitHub is required. Note: As noted by a reader, linking the TFTP root to the boot folder in the NFS tree allows the firmware to be updated. Linking or copying the contents of boot to NFS also allows I2C and SPI to work because the overlays in /boot are available to the OS. Warning: If other files from GitHub (possibly the start/fixup elf files) are used the Pi will NOT be able to see all available resources such as RAM. The logs show the files requested, so some clean-up can be done if desired. If any of the required files are missing, DHCP is not configured correctly or it cannot reach TFTP in my experience you won't even get the gradient screen. Extract the tar archive from the steps above. This can be copied and then edited from the boot partition of the SD card too. The Pi should now boot fully. printf "My NETWORK BOOTED IP address is %s\n" "$_IP"
drwxr-xr-x 2 root root 4.0K Mar  2 23:08 .
drwxr-xr-x 3 root root 4.0K Mar  2 23:06 ..
Mar  2 23:09:41 nas tftpd: tftpd: trying to get file: ea1b3c41/config. If config.txt was already symbolically linked them remove that first. The steps below describe how to create an SD card which will enable and verify USB Boot Mode (PXE) making it easier to configure a large number of Pi 3 devices in one go. In the following steps a few files are edited which can be done on a Pi or another machine that can edit the /boot and rootfs filesystems. As above, we must enable USB Boot Mode. 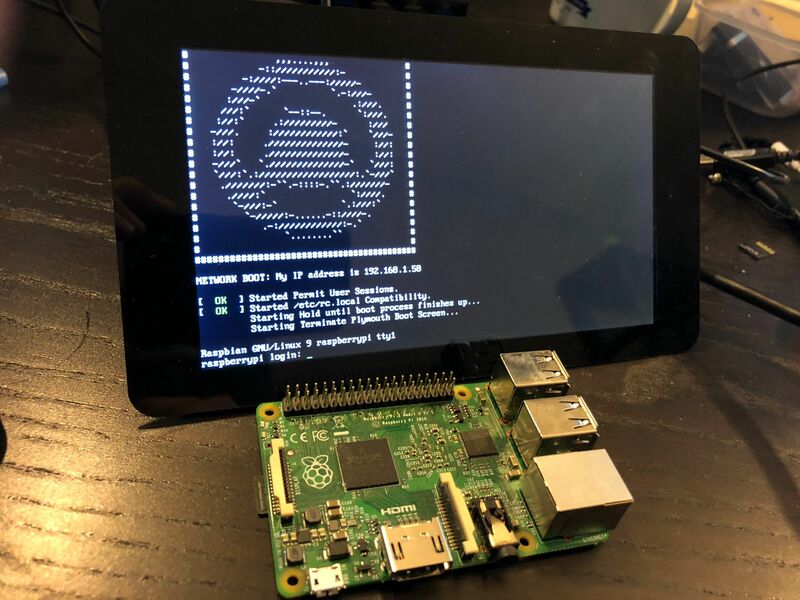 With a simple script the Pi can be checked on boot. The example below clears the screen to aid readability (not helpful for debugging boot issues) and then sleeps for a long time (24h), stopping the Pi from fully booting so the output is clearly seen, colour or other formatting could be added to make it more obvious! echo "Boot mode fine :) ($CHECK)"
echo "!!! Boot mode failed, value: $CHECK"
From this card each Pi 3 can be booted once which should enable USB boot mode (PXE) and confirm. The script could be updated to power off if successful with poweroff after the first echo in check-netboot.sh. All the devices have read-write access to the NFS file system in the configuration above, so any packages or changes installed on one are available to all. Additionally any SSH access or hosts keys as well as the /etc/passwd file are all shared so these changes will also propagate. While this might make it easier to make global changes (ie installing packages from apt) it is slow and I have seen errors at times, though these might have been permissions related before I found a solution to that, it seems best to make changes locally and re-clone the file system. Initially when trying to understand whether the Pi was booting from the network or not it was useful to enable NFS debugging with rpcdebug -m nfsd -s proc which reports quite verbosely to syslog. 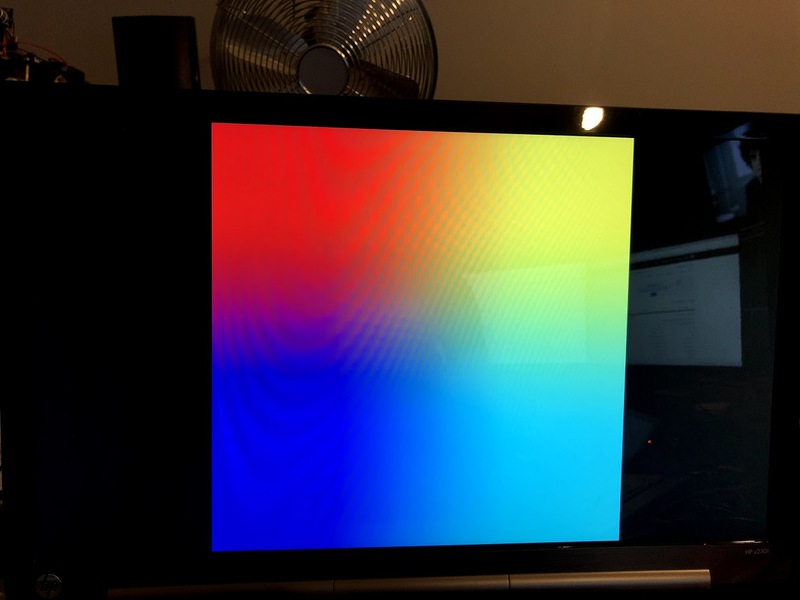 Update (2019-04-06): I finally had time to try out atftp, which does appear to have solved the touchscreen detection issue. The steps above to enable per-device config.txt options can also be used to override cmdline.txt (removing the symlinked version first) and specify an alternative NFS path. /etc/exports would also need to be updated. #		to NFS clients. See exports(5). /nfs/client2 is a copy of /nfs/client1 with a modified /etc/rc.local to verify. Running this from the NFS server will clone as root on both sides which should preserve the permissions without the need to create or tar an /nfs folder on the device. The first sudo allows rsync to set the right permissions and ownership on the local filesystem. The --rsync-path="sudo rsync" runs rsync as root on the Pi ensuring it has access to all files. With the default sudoers configuration it will not prompt for anything other than the pi user's SSH password. Remember to edit /etc/fstab in the NFS file system afterwards as well as removing /var/swap if it wasn't excluded. Run as ./clone.sh pi@192.168.1.59 /nfs/clientX. This is still not perfect so it is strongly advised to use rsync or tar as described previously. It would be wise to back it up before making any material configuration or package changes, just in-case. If the Pi is not requesting anything from TFTP it could be a DHCP configuration problem, or a TFTP access problem. If it gets further, but then hangs as shown further above it could be a NFS/filesystem access problem. 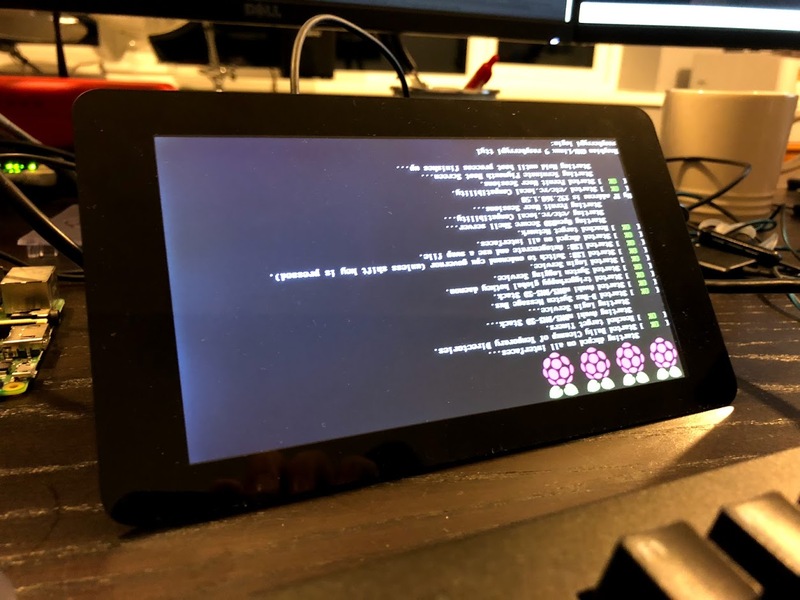 Not proven, however when debugging the misreported RAM issue I replaced my custom boot folder (with new symlinks) but the touchscreen Pi still appeared to pick up the old files as it was reporting lower RAM. Installing and configuring packages etc is naturally going to be slower as the Pi only has 100Mbit Ethernet and the overheads of using a network-based file system. For speed all config could be done on SD then copied over using the steps above.